I will always remember this summer as the summer I discovered Buckner Hollingsworth's books. My first discovery came when a friend and I were browsing in a nearby antique mall. I had gone my way in search of old gardening tools and books and she had gone her way in search of whatever. I met up with her as she was looking through several shelves of old books. 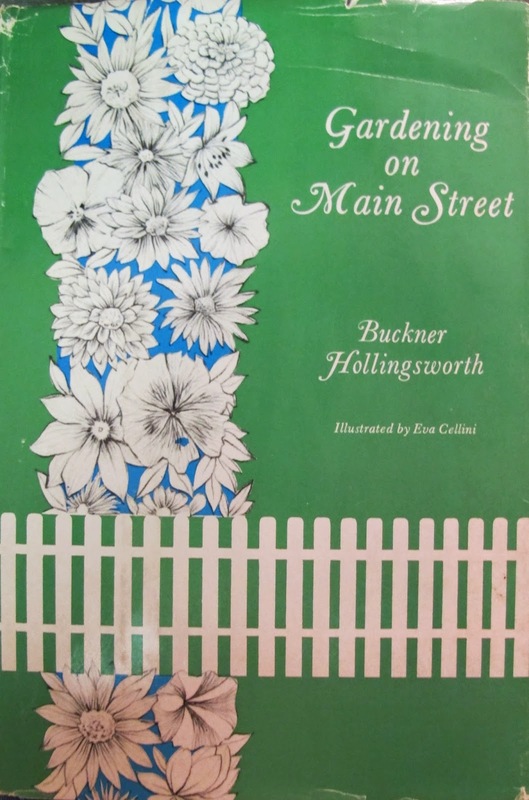 She handed me a copy of Gardening on Main Street by Buckner Hollingsworth (Rutgers University Press, 1968) and said she thought I would like it. Though it was newer than most of the old gardening books I buy, I decided to buy it because it looked interesting and would be a nice edition to my growing stack of "mid-century modern" gardening books, as I call the gardening books published in the 1940's, 50's and 60's. I went home and read the book and loved it. It's the simple story of a gardener's garden. Part way through the book I asked, "Who are you Buckner Hollingsworth?" Down the rabbit hole of the Internet I went in search of this garden writer. I found out she was really Edith Buckner Kirk Hollingsworth, known as Buckie to her friends and family. Born in 1892 in Baltimore, Maryland, (just two days after my own grandmother) she graduated from Bryn Mawr College, where one of her classmates was Katharine S. White, who wrote the classic Onward and Upward in the Garden. Buckie's younger sister, Mary, was a friend of Mrs. Wallis Simpson. Yes, that Wallis Simpson. Mary later married Ernest Simpson, after he divorced Wallis. Buckie's youngest sister, Anne, wrote a book about their sister Mary. Buckie served in the Red Cross in World War I and later married the artist Will Hollingsworth with whom she had one one son, Kirk. Eventually Will and Buckie bought a house on Main Street in Windsor, Vermont, where they lived and she gardened. A web site about Will is a goldmine of information if you are looking especially for pictures of Buckie as I was one evening several weeks ago. Buckie passed away in 1979 and many of her letters and correspondence related to her books and her sister Mary are now housed in a library at Harvard University. This lovely book is a collection of essays Buckie wrote about women gardeners from the 17th, 18th, 19th, and very early 20th centuries. It's a gold mine of information all on its own and was reviewed by Katharine S. White, though not with great enthusiasm. In a letter sent by Katharine S. White to Elizabeth Lawrence dated June 5, 1962, White writes she couldn't give Buckie's book an enthusiastic review. She "detected many small errors in fact..." She felt bad about the short review she did include in The New Yorker, because Buckie was an old friend and according to White, almost totally blind. 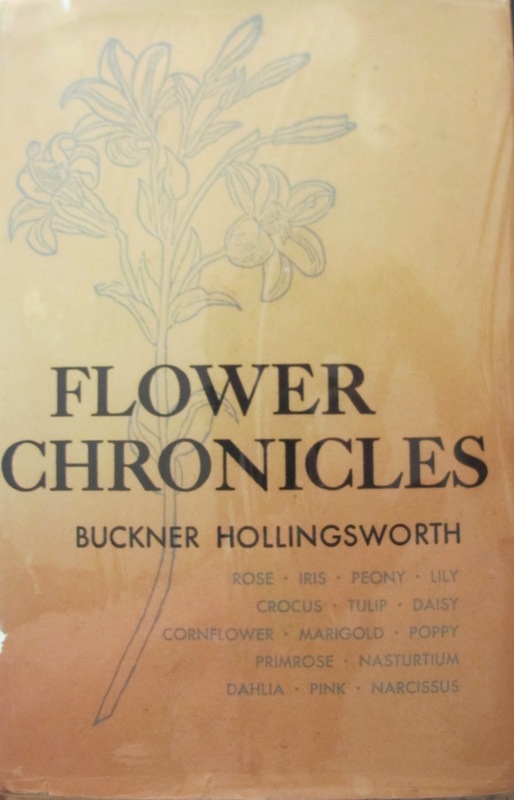 Buckie also wrote Flower Chronicles (Rutgers University Press, 1958) in which she tells the history of several different flowers. As noted in the front flap, "Every gardener knows that his craft is immemorially old, and that the flowers of this year's blossoming are the latest delights in a sequence rooted in centuries and millennia. 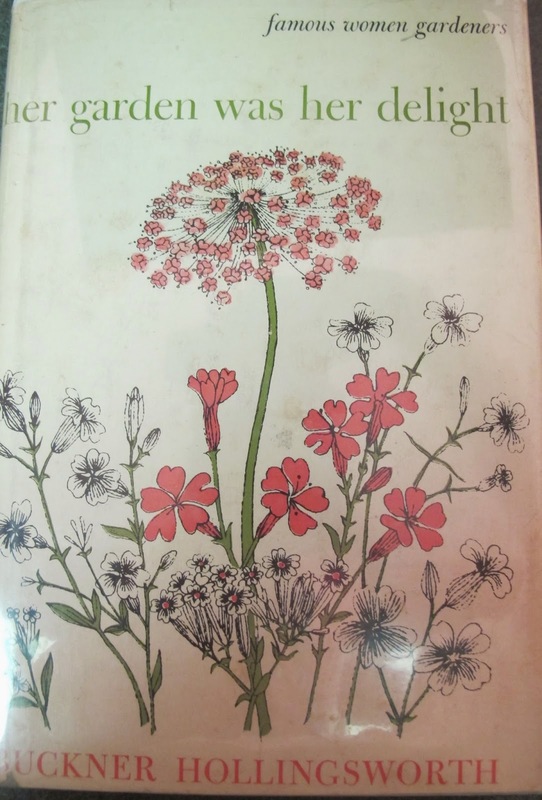 This is a book to affirm the gardener's sense of the past, to reaffirm the ancient sense of connection between this year's blossoms and the story of flowers and men as it has happened in many times, many places and among many peoples." In many ways, Gardening on Main Street is also an affirmation of the "gardener's sense of the past", the timeless story of a garden and the relationship a gardener forms with her garden and with the universe of gardeners past and present. I think what I enjoyed most about Gardening on Main Street is that reading it was like sitting in Buckie's garden or in her kitchen, listening to her tell the story of her garden. I can imagine arriving early and following her around the garden, stopping here and there as she tells me how she solved the problem of what to plant along the narrow front garden, how beautiful the morning glory vine is that grows by her front door, and how she and Will rigged up a garden hose to keep the water moving in her little fish pond. Buckner Hollingsworth. Until this summer, I never knew her. But meeting her through her books has added to my life and thoughts as a gardener, and convinced me, once again, that stories of gardens really are timeless. I read those letters between EL and KSW this winter ,so this is the book . I will look out for it, despite the bad review. I'm reading 'Onward and upward' at the moment , enjoying it very much . Carol, Buckie was new to me also and like you I have a collection of books "about" gardens and gardeners. I love reading them. But I wanted to mention how you brought to mind that every plant we work with is connected to its forebears from generations past. I had not thought of that. There are no "new" plants are there? Wow, those books sound wonderful. I may have to pick a few of them up myself! Mr. Mitchell also recommended Karl Capek, (The Gardener's Year), and in this too he was not wrong.